As a child, did you ever go into the deep end of a pool, when you knew it was wrong? We all have experienced the reckless sense of adventure at one time in our lives, and that is what I am experiencing as I write this blog. As I reflect on 2017, I am intrigued and concerned that the new ‘political weapon of choice,’ is the accusation of sexual harassment. Oh, don’t get me wrong, there are definitely some first class slime balls in this world that use their position and authority, such as Harvey Weinstein. But are there innocent people being accused? And what the heck entails sexual harassment anyway? Does it involve physical actions or can it be words? So here I am, Grandpa T, wading into the deeper water without my pink and lime green water wings. One of my concerns about the subject of ‘sexual harassment’ is that it can be almost indefensible if you are accused of sexual harassment. Let me provide a scenario. Accuser: “I was subjected to sexual harassment from my boss at my workplace. Response: “Why didn’t you report this?” Accuser: “I was afraid I would lose my job.” Whether it be true or not, how does the accused defend themselves against such an accusation? No witnesses. No proof. But the accusation itself receives the prominence of a verdict without a trial. This is especially so in today’s over-reactive society. The first person that set the stage for sexual harassment was our POTUS, Donald Trump. If you remember, during the Republican primaries, about a dozen women jumped on the bandwagon and accused Donald Trump of sexual harassment. What was intriguing about these accusations was that they all were within about 36 hours, and they were made only when it appeared Donald was a viable candidate to receive the Republican nomination. Donald’s response? After denying the accusations, he said he would sue each and every accuser. (When you are a billionaire, you can afford such things!) The result? The accusers disappeared…almost miraculously! Hmmmm. A couple of weeks ago, on her NBC morning show, Megyn Kelly had a program interviewing women about sexual harassment. I caught part of that program. One of her guests spent an inordinately amount of boring time relating that she had been ‘ogled’ in the workplace. Ogled? Are you kidding me? So let me get this straight. This woman thought that because of the way men look at her, she is being sexually harassed? Call me old-fashioned, call me ignorant, but in all the days I have walked on planet Earth, I thought women wanted to be noticed by men. If you are married and your wife just gets back from having her hair and nails done, what do you think you are having for dinner if you don’t notice said hair and nails and make a positive comment about the beautiful results of those treatments? I’m smart enough to know where my bread is buttered as I always notice and make a positive comment that is always appreciated by Grandma P. My personal Grandpa T theory is that if women did not want to be noticed, they would all dress like the Amish! I have never been accused of sexual harassment, by any woman, when I commented on how lovely they looked, how nice their hair looked, or the beauty of her dress. I was thanked every time. 2017 has become a milestone year for the accusations of sexual harassment as the ‘political weapon of choice.’ Look at all the men who have fallen from grace this year. Representative John Conyers of Michigan, Senator Al Franken of Minnesota, and senate candidate Roy Moore of Alabama have all been in the cross-hairs of sexual harassment accusations. Each of the circumstances for these three men are different. John Conyers is the most interesting in that he has been a Congressman for over 50 years. He was the first black person to achieve this goal. But, one of his staffers accused him of sexual harassment, and was paid a $27,000 settlement with the use of public funds. A second accuser came forth, and after an investigation by the House Ethics Committee, it was determined that these accusers, plus sexual harassment allegations by others, were true. The Democrats in Congress withdrew their support and called for his resignation. He resigned on December 5. I am not exactly sure of what Republican senatorial candidate Roy Moore did in Alabama. During Moore’s election campaign for the Senate, a total of nine women accused Moore of inappropriate sexual or social conduct. Three of the women said they had been sexually assaulted by Moore when they were aged 14, 15, and 28. The other six described him pursuing a romantic relationship with them while he was in his 30s and they were as young as 16, (the age of consent in Alabama) but said there had not been any inappropriate sexual contact. I find a couple of disturbing items about the Roy Moore affair. Firstly, Roy Moore had been in 8 previous elections in Alabama. Why did these accusations not surface at an earlier election? Secondly, these accusations were made 40 years after the events occurred. 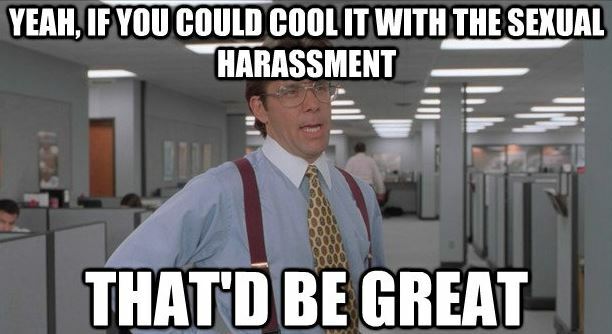 Should there be some kind of ‘statute of limitations’ on sexual harassment accusations? Don’t think for one minute that I am defending Roy Moore. I am not and I am glad he lost even though I would have appreciated a different Republican candidate in the race. But my favorite victim of sexual harassment allegations is that mental giant from Minnesota, Senator Al Franken. Al has a distinction among the disgraced and fallen that the others do not….proof. Lots and lots of pictures as proof. Forgetting that he was no longer a writer on Saturday Night Live, and was a U.S Senator, Al thought it would be hilarious to have a picture taken with his hands cupped over the breasts of a sleeping beauty while on a USO tour. Now there is a display of class! After this picture became public, more accusers came forth describing how he grabbed their buttocks while having their pictures taken with him at the Minnesota State Fair. After that admission, numerous other accusers have come forth. Apparently, Al had roaming hands and an inquisitive tongue. He has appropriately resigned the Senate, and will be replaced on January 2 by the female Lt. Governor from Minnesota. In a resignation speech that contained no apology and absolutely no remorse for his actions, the fallen Senator took the podium to point out the faults of the POTUS. Apparently, Mensa Al was drug-addled during the Bill Clinton administration. Most of these guys got what they deserved. But that still does not adequately define sexual harassment. Should a woman be required to tolerate unwanted ‘touchy feely?’ Absolutely not! (I am being sexist here, and assuming all victims are female.) And I would believe that a stern verbal warning would stop 95% of the men in their tracks. The other 5%, as repeating offenders need their faces slapped! A woman always has the option of reporting the harassment. If it cannot be reported to the boss (because he is the accused! ), report it to the authorities. With the temperament of intolerance in today’s society, the authorities will definitely get involved. The real gray area in the sexual harassment equation is the unwanted verbal harassment. Are words really harassment? The receiver may not appreciate the words, but at least there is no physical contact. My advice? Refer to the paragraph immediately above. There you have it for 20017. I completed two grueling laps around the pool after I found my pink and lime green water wings. Should I be concerned when I caught Grandma P attempting to pull the air plug? PS: Happy New Year everyone! May everyone have a healthy and prosperous year. Yesterday, on the anniversary of my blog, I received over 200,000 additional unique hits over the last year. Thank you for allowing me to indulge in my hobby. This entry was posted in Common Sense, Common Sense Solutions, Political Insight, Political Opinion, Politics and tagged Al Franken, Bill Clinton, Donald Trump, John Conyers, Megyn Kelly, Rep. John Conyers, Roy Moore, Senator Al Franken, sexual harassment, sexual harassment as a political tool on December 31, 2017 by Grandpa T.